Old Breweries Information | Breweriana Values | Happy Beers! Our site holds a comprehensive listing of US Breweries that are listed by state for browsing. You can also use our handy search feature to quickly find information on a particular brewery. We have over 18,000 listings for breweries on the site so settle in because you could be here for a while! Most of the information on breweries here was originally in American Breweries II if you are familiar with that format. You can browse by state, or search based on Brewery Name or the Alphanumeric Listings used in American Brewieries (i.e. CA 89a, MI 162, or OH 266g). If you can’t find what you’re looking for on the site, or need help finding the value of a Breweriana item, please don’t hesitate to Contact Us from the contact form, by email: dale@oldbreweries.com or phone: 404-606-2648. We are happy to help you evaluate your brewery item for rarity and value. Most items won’t be very valuable if they are from the last 30 or 40 years but some things such as lighted signs, or posters can be valuable. Older items that date to Pre-Prohibition have a much higher chance of being valuable. 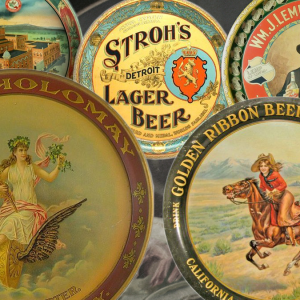 We will offer to buy most Pre-Prohibition brewery items and even many Post-Prohibition items, whether you have one beer tray or an entire collection, please don’t hesitate to contact us! We offer this service as a way to save you the frustration of dealing with craigslist or ebay’s fees. You get paid without the long wait of consigning to an auction. All you need to do is send us an email or text message with pictures of your item or items. We will be happy to help you evaluate them for you. 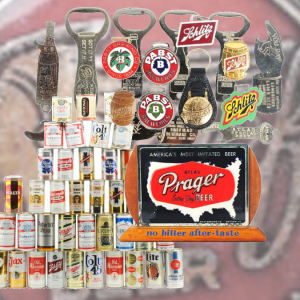 We take a look at items based on age, condition, rarity, and demand and we are active in the breweriana field so we know many top collectors and dealers. If you decide to sell an item to us, here’s how it works: We send you a check or Paypal payment first so you’re not taking any risks. Once you’re happy that the funds have cleared, you ship us the item with a tracking number. We take all the risk, and it’s easy for you! We pay quickly so you don’t have to wait for an auction or pay fees! We can help with beer mugs, steins and glasses. 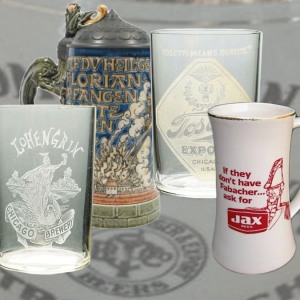 For glasses we deal mainly with early etched glasses for breweries pre-1940, mugs and steins need to be old to be of much value. 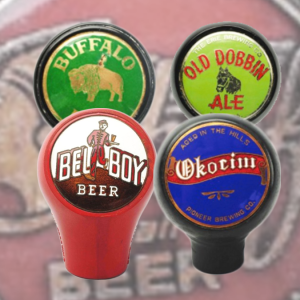 Ball Knobs or Tap Knobs used on beer taps at bars. The most collectible date to the period after Prohibition in the 30's when the law required any tap to display the brand of beer it was dispensing. The most valuable trays date to Pre-Prohibition, the period before 1920, though there are some rare trays from the 30's and 40's. 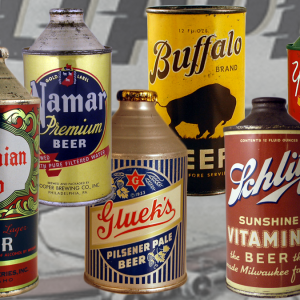 We will appraise or offer to buy old and vintage cans, especially conetops, crowntainers, flat tops, and tab tops. 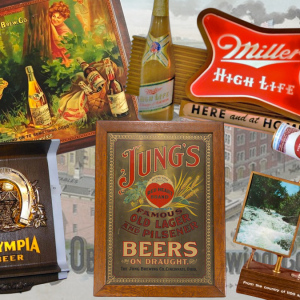 All types of signs from: Porcelain, Tin, Lithographed, Framed, Lighted, Neons, Moving, and Reverse-Glass. Also light-up and moving displays, preferably pre-1980.